Admission process begins with Registration in the month of October every year. To be admitted to Class I, a child must be 6 years oldon the date of commencement of the Academic Session. Procuring the Registration Form from the School Office OR Online andsubmitting the duly filled in Form along with a non-refundable Registration Fee. Submission of Registration Form can also be done online. Evaluation of the standard of the student seeking admission for a particular class by the School through its own system. Interaction with the student as well as the parents. Securing the Admission of the student by paying the Admission Fee (Non-Refundable)& Security Deposit. Birth Certificate of the child. The Original copy to be shown to the School's Office and the photocopy to be submitted. Photocopy of the latest Progress Report/Mark Sheet of the pupil issued by the School attended last. Transfer Certificate in Original issued by the School attended last. Photocopy of the Identity Proof (Voter ID Card / Aadhaar Card / Passport) of the parents. Six copies of coloured passport sized recent photographs of the child and one copy of the recent photograph of the child with her/his Father & Mother together. Duly completed Health Certificate From prescribed by the School and certified by a registered Medical Practitioner (not below M.B.B.S). Any other relevant documents like Certificate proof of SC/ST/OBC etc. The parents will be required to submit the requisite documents in original and/or photocopies on or before the date of joining the school. Until and unless all the requisite documents have been submitted by the parents/guardians, the Admission will stand Provisional. The School extends Admission Facilities for girls and boys to Class XI in Science, Commerce and Humanities stream according to their academic ability, aptitude, interest and attainment in their last Board/Council Examination. However, the admission process begins with Registration in the month of January every year subject to fulfillment of the School Criteria. A pupil of Father LeBlond School, after successful completion of I.C.S.E., interested in pursuing her/his Higher Secondary Level studies at Father LeBlond School, will be required to apply for re-admission and comply with all the requisite formalities for admission to Class XI applicable to any other candidate. Submission of the original/attested photocopy of the results of Class IX Annual Examination & the same of the Class X Pre-Board/Selection Examination. Evaluation of the standard of the student seeking admission to Class XI by the School through its own system. Securing the Admission of the student by paying the Admission Fee (Non-Refundable) & Security Deposit. Photocopy of the Progress Report/Mark Sheet of Class IX and the Statement of Marks obtained by the candidate in her/his Pre-Board/Selection Examination. Transfer Certificate in Original issued by the previous school attended last. Character Certificate from the Head of the School attended last. Photocopy of the Identity Proof (Voter ID Card/Aadhaar Card/Passport) of the parents. Six copies of coloured passport sized recent photographs of the child and one copy of a recent photograph of the child with her/his Father & Mother together. The parents will be required to submit the other important documents like Admit Card for the ICSE/CBSE/Madhyamik Examination (English Medium) or any other equivalent Examination on or before the date of joining the school. Mark Sheet of the Board Examination passed, Pass Certificate, Migration Certificate and Character Certificate in original and/or Photocopies to be submitted within fifteen days of declaration of results by the concerned Board. Until and unless all the requisite documents have been submitted by the parents/guardians, the Admission will stand provisional. Any candidate passing out Class X Board Examination from a Board or Council other than C.I.S.C.E., New Delhi must submit their original Mark Sheet after the results are declared for verification and scrutiny by the authorities of C.I.S.C.E. Council for granting and approving admission. Admission of such candidate will remain provisional until formal approval and permission for admission to this School is obtained from C.I.S.C.E., New Delhi. Based on the performance of the candidate in the School Evaluation System and Face-to-Face Interaction, the Admission Committee of the school shall prepare a list of successful candidates, and admissions will be offered to them subject to availability of seats in a particular class. Limited seats are reserved for candidates who are good at sports and other extra co-curricular activities and possess necessary certification for the same. Any error, mistake or misinformation detected in the Registration or Admission Form will be reason for refusal of admission or immediate withdrawal of the student from the school, if admitted, without refund of fee paid. The decision of the Admission Committee (regarding admission of a child) shall always be final and binding. After the admission offers are made by the school and received by the parents, they must complete the admission process by paying the requisite fees and charges within 15 days of the offer. In case there is no response on the offer of admission within 15 days, the admission opportunity shall stand cancelled. 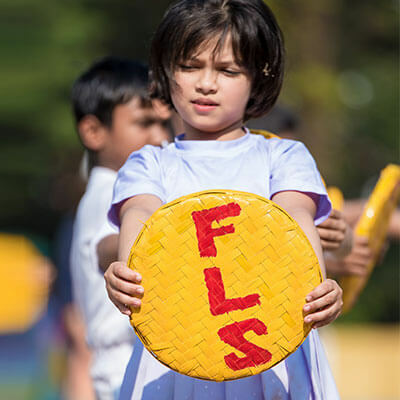 All the new students are to join the school on one particular day - "F.L.S. INDUCTION DAY". With the passage of time, as the situation will demand, there may be some changes/modifications to the rules of the school regarding the Admission Procedure.